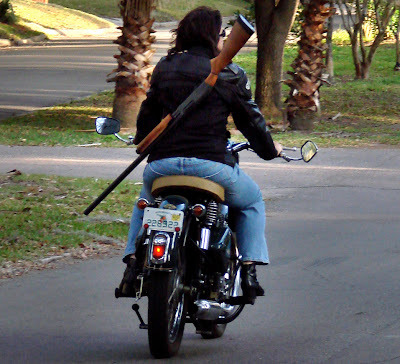 A shotgun is not the easiest thing to carry on a Royal Enfield. Royal Enfield rider Leigh Murphy did the unusual, taking a Royal Enfield on the challenging Tail of the Dragon, twisty U.S. 129 between Deals Gap, N.C. and Tennessee. That was in 2011. More recently she did the unusual by riding home from a gun show with a 12-gauge shotgun across her back. "It's me antagonizing my stuffy yuppie neighbors," she wrote in a light-hearted email accompanying the photo. But the shotgun was not purely for show. "Well, I did learn to shoot a .38 after there was an uptick in crime in my neighborhood," she said. "This is a 12-gauge Remington 870 Wingmaster I got at a gun show before I went through the hassle of getting the .38 since there was no waiting period required and I could do cash and carry. "The problem was that I rode to the gun show on my bike and wasn't sure how to get it home. The police officer on duty told me it wasn't against the law — but probably not a good idea — to just strap it across my back and tote it home that way. "I can say I had NO tailgating problems the entire trip home with it. "I really should get out to a range and get used to the kick but there are not many (legal) places to practice around here that will allow shotguns." More pandering to the gun "culture". What pandering? What agenda? The story is related to Royal Enfield, is unusual and interesting. Such intolerance. ..even though R-E never made smoothbore weapons. Wow, I can't believe the reactions to this article! Certainly "lighthearted" was appropriate: It made clear that she was just joking. Her remark about stuffy yuppie neighbors was certainly in jest. It actually should have gone without saying, yet the reactions by Chuck D and the first anonymous say otherwise. It never would have occurred to me that anyone who keeps up with this blog would have had a problem with a person owning a shotgun, and the idea that the mere mention of it is somehow either pandering (trying to get more readers? Not sure what he meant, actually), or that it speaks to an agenda (what, exactly, do you think David's agenda is, Mr. Anon?) is baffling. I personally think that the U.S. needs to get a handle on its gun problem, but hardly anyone thinks that means outlawing them completely, or that it has anything to do with shotguns. There's no agenda here, just an interesting article.